Who says you are not able to enjoy driving a vehicle that is just as suited for a trip out into the woods as it is for a night out on the streets of Youngstown? Thanks to the Nissan Armadas offered up for sale or lease here at Boardman Nissan, having your cake and eating it too has never been easier. To prove this point, and bring you up to speed on all the Armada has to offer, be sure to follow along as the Boardman Nissan team provides some valuable insight into the myriad features found in this class-leading sport utility vehicle (SUV). Owning or leasing a full-size SUV often means you need a vehicle that is ready to do some heavy lifting. Fortunately, the Nissan Armada is just the automobile for the job. 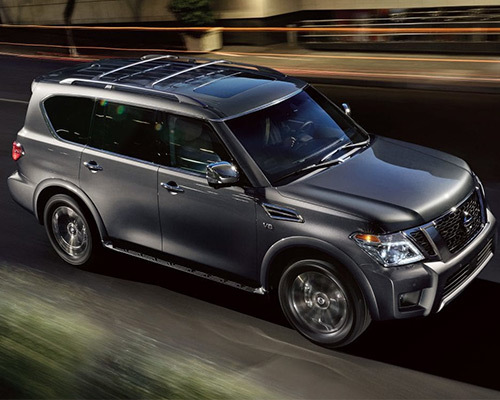 Whether you are making use of its impressive 5.6-liter (L) Direct Injection Gasoline (DIG) V8 engine, with comes loaded with 390 horsepower (hp) and 394 pound-feet (lb.-ft.) of torque, or the Armada's 8,500 pounds (lbs.) of max towing capacity, the fact remains the same: Nissan has created a SUV that has more than enough power to tackle anything that stands in your way. While the Armada definitely has a stylish side to it, don't be fooled; this SUV has everything needed to conquer any trail set before it. In fact, with Armada's advanced four-wheel drive (4WD) system on your side, tackling even the most rugged of terrain is all just a walk in the park. 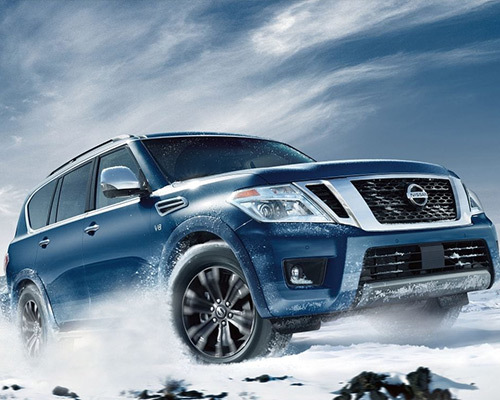 From automatically switching between two-wheel drive (2WD) and 4WD to giving you the power to manually switch between 4H (designed for rocky, snowy, and muddy roads) and 4L (which offers up maximum torque on steep terrain) modes, the possibilities are endless with a Nissan Armada in your garage. Are you ready for an adventure that begins where the pavement ends? With the ability to seat up to eight, it is not unreasonable to think that the Nissan Armada has to sacrifice storage space to accommodate this many passengers. However, this notion could not be further from the truth. Thanks to a 60/40-split back seat, cargo capacity with the seat up at 23.6 cubic-feet (cu.-ft.), 171.1 cu.-ft. with the seat down, an available power third-row bench, and even a hidden underfloor storage area, owning or leasing a Nissan Armada from Boardman Nissan allows you to truly match (and exceed) your cargo needs. Packed with all of the tools you need to optimize your daily routine, the Nissan Armada SV is a leader in its class for a reason. Whether you enjoy its Intelligent Cruise Control, signature LED low-beam headlights, or spacious accommodations, it is safe to say that finding something to like about this full-size SUV is far from difficult. Are you ready to see for yourself why so many of our friends in Youngstown end up driving home in an alluring new Armada SV? Then be sure to stop by Boardman Nissan today. Enjoying the finer things in life has never been easier than with the Armada SL in your corner. To see the truth in this statement, all you need to do is look at the SL's Intelligent Around View monitor, remote engine start system, leather-appointed seats, and countless other premium additions. Adding in some stylish upgrades, like 20-inch (in.) machine-finished aluminum-alloy wheels, further drives home this point and ensures the SL is truly in a class of its own. The pinnacle of luxury is found at the heart of the Armada Platinum. Of course, when you lay claim to climate-controlled front seats, a Tri-Zone Entertainment System that features an eight-in. monitor, Platinum reserve interior badging, and open-pore wood-tone and black quartz trim, meeting (and exceeding) these lofty expectations is all just par for the course. When you are ready to truly understand the meaning of automotive luxury, be sure to come talk to us about the Armada Platinum. While most cars focus on keeping the tech features up front, the Nissan Armada looks at things a different way. Specifically, the available Tri-Zone Entertainment System brings an interactive experience to everyone, even those who end up sitting in the rear seats. Watching movies, playing video games via a compatible connected system, and so much more await those in the rear of the Armada, all while individuals up front enjoy listening to something else entirely via the Armada's available eight-in. touchscreen. 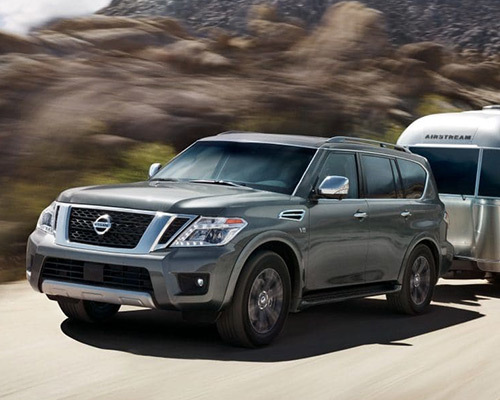 Smart technology is a major cornerstone of the Nissan Armada experience. Nothing drives this point home better than the Nissan Intelligent Key setup. From allowing you to tap a button on the door handle to unlock your SUV while you keep your keys in your pocket or purse to starting the engine remotely and remembering each driver's preferred settings via the associated Memory System, the Armada has shown once again it is a class leader positioned firmly on the cutting-edge of convenience and technology. To ensure no competitor ever comes close to the level of amenities found in the Armada, Nissan has really outdone itself by getting all of the little details right. From sound absorbing windshields and windows to welcome lighting that illuminates the ground around your doors, premium features abound in this full-size SUV. If you opt to include the NissanConnect package in your Armada ownership or leasing experience, bringing Amazon's Alexa or the Google Assistant with you along every mile traveled is just another feature to add to the list. The best part of this list? It is just the tip of the iceberg in terms of what Nissan is doing to ensure your time spent behind the wheel of an Armada is safer than ever. Once you combine it with the rest of what you have learned here, one thing should be crystal clear: If you truly want to enjoy the finest ride found on the streets of Youngstown OH, then now is the time to stop by Boardman Nissan and learn a little more about how you can buy or lease an Armada of your own.